I made Smothered Pork Chops in the previous post. How can you have a dish like that without something wonderful to sop up the gravy? It would be sacrilege! So, I made a batch of Herb Biscuits. I mixed the dry ingredients together and then cut the butter in with a pastry blender until the mixture was crumbly. I put the lemon juice in a measuring cup and added milk to make 200 ml (3/4 cup) of liquids. I made a well in the centre of the dried ingredients and poured in the liquids. Mix just until the dough is moistened and can be brought together in a loose ball. Over mixing will make tough biscuits. I dumped the dough on a floured surface and kneaded it four or five times until it formed a ball. I shaped it into a 1 inch thick square and used a glass to cut out 4 biscuits. Reform the remaining dough and cut two more biscuits. You need to know these reformed biscuits will not rise quite as much. I put them on a baking sheet and baked them in a preheated 400 F oven for 18 minutes, until browned and cooked through. These are great biscuits. Light and tender with a touch of savoury from the herbs. They were an excellent vehicle for sopping up the gravy from the smothered pork chops. I do love a good biscuit. Mix flour, baking powder, Italian seasoning, salt and baking soda in a bowl. Using a pastry blender or two knives, cut the butter into the dry ingredients until crumbly. Put lemon juice in a measuring cup. Add enough milk to make 175 ml (3/4 cup) liquids. Make a well in the centre of the dry ingredients. Slowly mix in liquid just until the mixture forms a crumbly ball. Turn the dough onto a floured surface and knead s few times, just until it holds together. Form a 1 inch thick square. Using a glass, cut out 4 biscuits. Reform the trimmings and cut out 2 more biscuits. 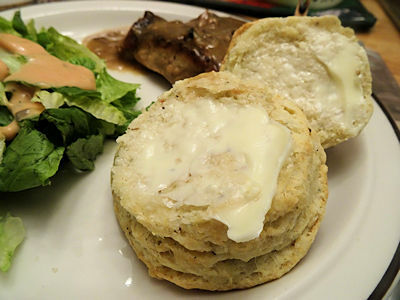 Put the biscuits on a baking tray and bake for 15 to 20 minutes, until browned and cooked through. Just look how many flaky layers those have! Yum! Har! you have to love biscuits. A must try recipe. Thanks for sharing.